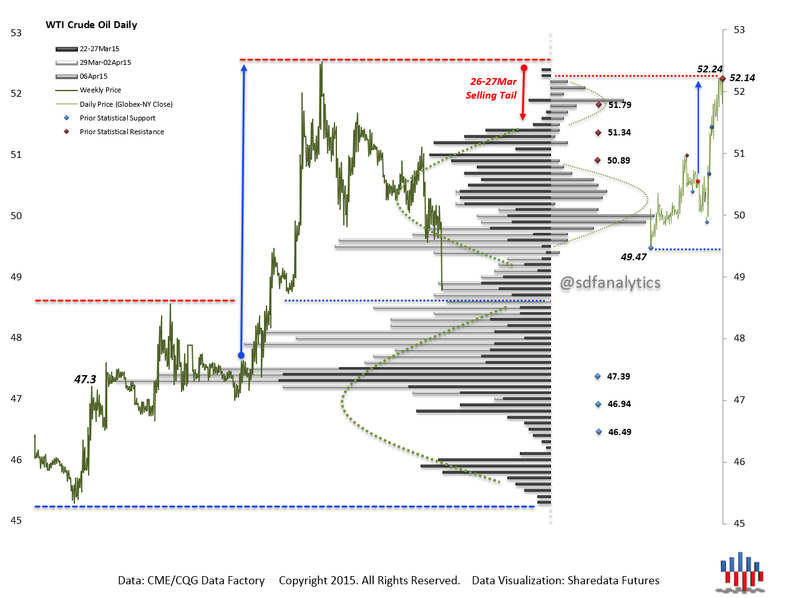 As noted in Thu’s analysis, focus on response to the Key Demand Area, 48.50s-48s, was key in Mon’s auction as short covering inventory adjustment drove price higher into Key Structural Resistance, 52.40s-51.50s. Focus into Tue’s auction on response to Mon’s Unsecured High, 52.25s. 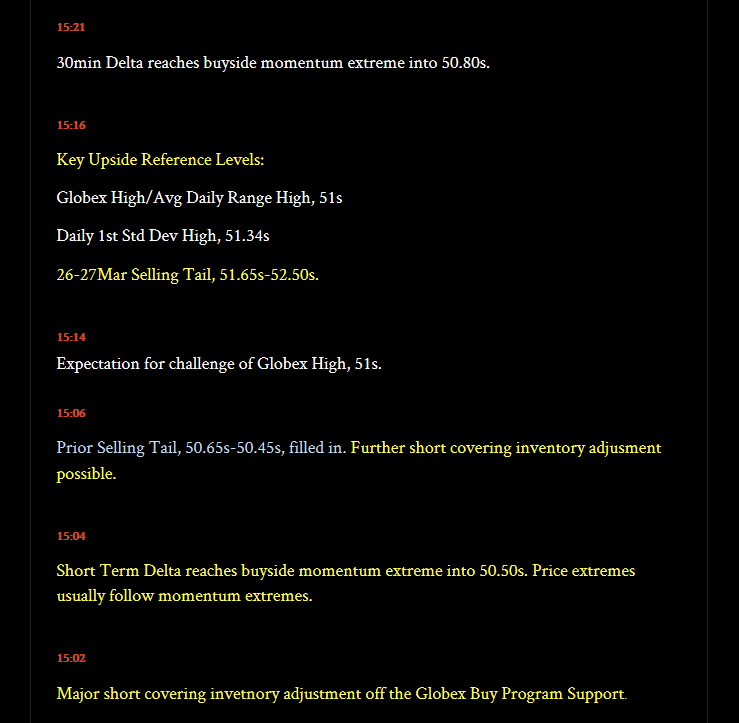 Short covering inventory adjustment off the Globex Buy Program Support Area at/near 50s. 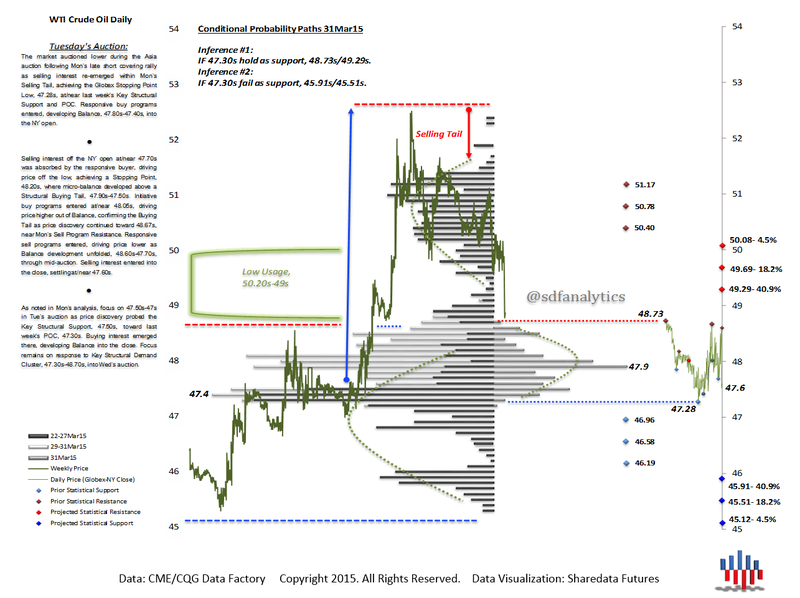 Buyside filling-in of the prior Selling Tail, 50.45s-50.65s, implied structural potential for price discovery higher. Key upside reference levels included the 26-27Mar Selling Tail, 51.65s-52.50s. Ultimately, the market traded to 52.25s. As noted in Tue’s analysis, focus on response to Key Structural Demand Cluster, 47.30s-48.70s, was key in Wed’s auction as buying interest drove price higher toward the Daily 2nd Std Dev High. 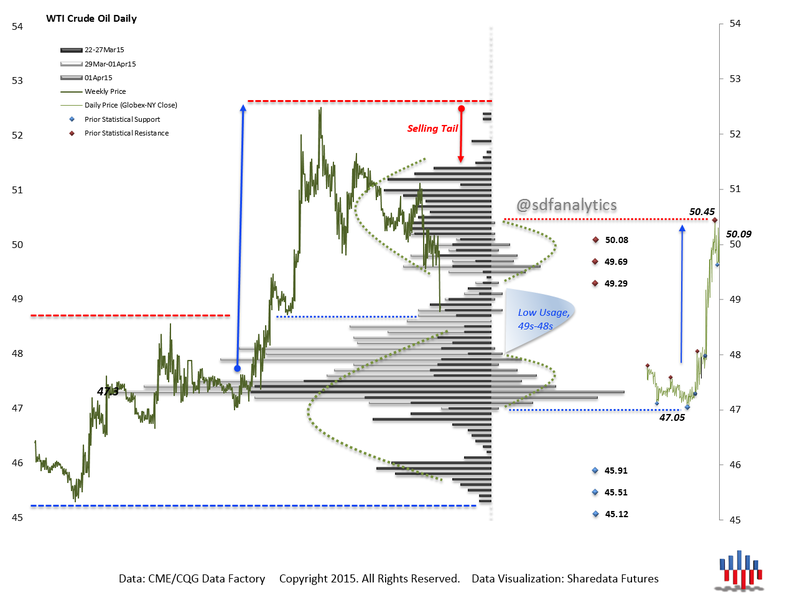 Focus on response to retracement to the Breakout Area/Prior Resistance, 49s-48.50s into Thu’s auction. Initiative buy programs (IBP) driving price higher from 48s. 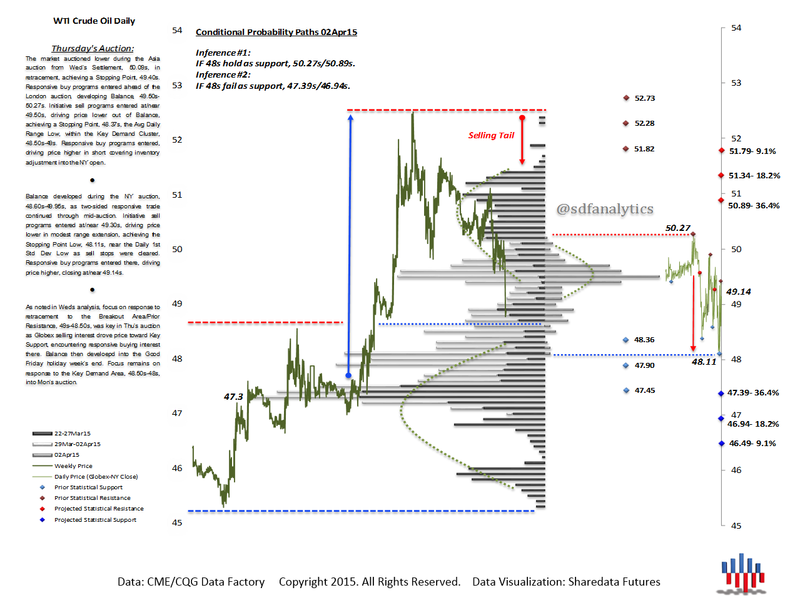 30min Buyside Delta Momentum extreme reached at/near 49.20s with the expectation for a higher priced Stopping Point. 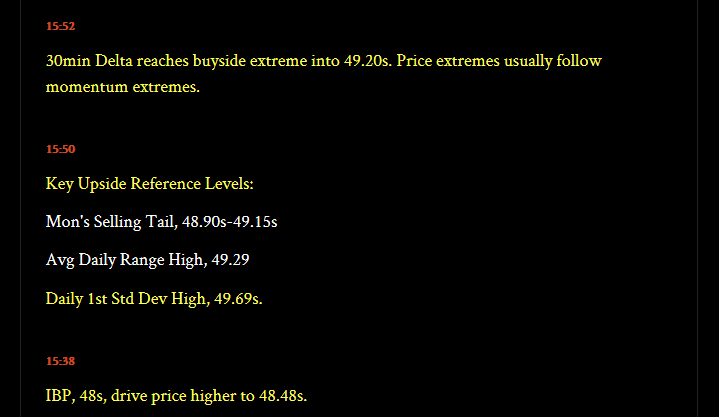 Key upside reference levels to the Daily 1st Std Dev High, 49.69s. Ultimately, the market achieved the Stopping Point High near the Daily 2nd Std Dev High expectation, 49.69s.